Discover the Royal landscape of Regent’s Park during a Private Photography Walking Tour. This is a grand photo walking tour which explores colorful gardens and dynamic fountains and water features in one of London’s greatest parks. This walking tour is for the scenic photographer who loves to integrate wildlife, plants, trees, people and sumptuous colour in their shots. We take in the Avenue Gardens and explore the formal flower beds which in the summer months are full of colourful bedding plants. We marvel at the ornate water fountains and magnificent plant containers which are larger than life. We enjoy the formal pruning of fir trees which line our view through this avenue of colourful planting. We make our way to Queen Mary’s Gardens which have dedicated areas devoted to roses and ornate water plants. The rose garden is London’s largest collection of roses with over 12,000 roses. At every step there is a different colour to photograph as the park wildlife of ducks, squirrels and geese line our way. Explore the highlights of the Japanese Garden centrally placed in a small lake in the heart of St Mary’s Gardens. Finally we make our way to the boating lake to photograph the activity on the lake as visitors take to the water, feeding ducks and geese from their boats. 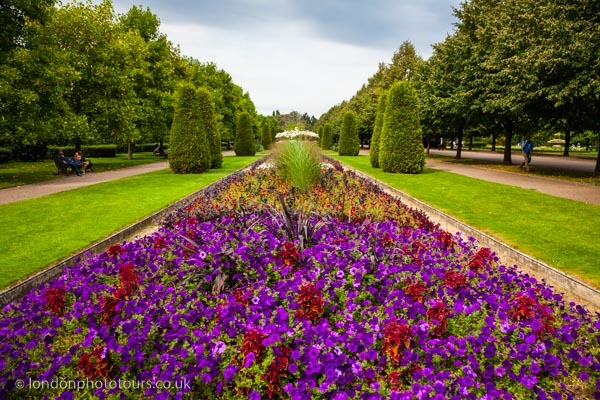 This is a wonderful photography tour which is a must for landscape garden lovers who wish to learn how to photograph Regent’s Park with all its complexity of colour, shape and textures which make up the life of the park.